We enjoy being a part of the family he created, living in Fredericksburg. Through that family, his integrity and character continue to shape our community. YOU were a precious gift from God above, so much beauty, grace and love. YOU touched our hearts in many ways, your smile so bright even on the bad days. YOU heard God's whisper calling you home, you didn't want to go and leave us alone. YOU loved us so much, you held on tight, 'til all your strength was gone and could no longer fight. Myrtle was a generous and active participant in the GRACE community, and we miss her terribly. 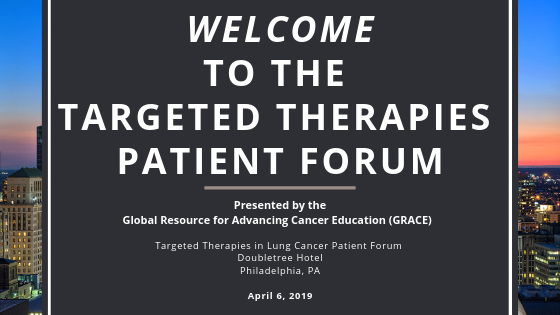 Her nonprofit organization, the Lung Cancer Connection lives on, continuing to provide valuable information to patients and families about the diagnosis and treatment of lung cancer. The Elkes Foundation is pleased to help fund the GRACE pancreatic cancer area in honor of Ruth Elkes. She spent her life volunteering and helping others, including participating in clinical trials through her battle with pancreatic cancer. We would also like to remember the devotion and support given to her by her husband, Terrence Elkes, and hope that this site can serve as a resource for patients and their caregivers alike. This tribute honors my Mom's oncologist, Dr. Macapinlac. At a time when my family needed words of knowledge and comfort, Dr. Mac delivered. He is knowledgeable, compassionate, professional, caring, and just a wonderful and good person. Dr. Mac was a blessing to us during our battle and we are sure he continues to be a blessing in the lives of his patients and their families. Although the battle for our loved one has ended, we could not have begun to fight without Dr. Mac in our corner. We thank him for all he did for us.